Heap is a 2-4-player game of fast and furious action with a dash of hilarious fun and goblin mayhem. It takes place in a post-apocalyptic wasteland where warring gangs of goblin bodgers fight over the wreckage of great battles to find new parts for their motley fleets of deadly motor vehicles. Sites of the largest and most extended battles draw the biggest and baddest gangs to the heaps of burned vehicle husks and discarded ordnance with their hearts set on hauling away enough useful salvage to fortify their power. The bodgers who can assemble the most impressive collection of maniacal machines and drive off the rival gangs in their area will claim the rest of the scrap for themselves. Privateer Press presents a look at Heap, the madcap card game of vehicular chaos where gangs of crazed goblin bodgers fight for the scraps of a post-apocalyptic world. 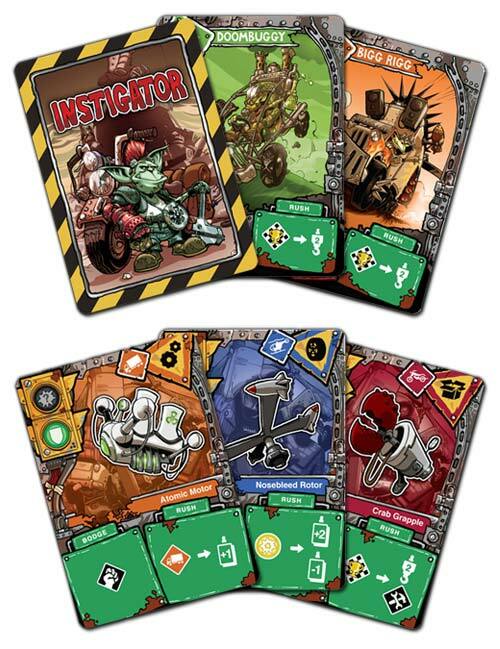 In this card game for 2-4 players, whoever cobbles together the most outrageous vehicles will rule the heap! At its core, Heap does not require a whole lot of brainpower, nor does it allow for too terribly much strategy. That said, the game is a great way to pass half an hour. The game requires players to build up their four vehicles in the hopes of being the first player to attach three items to all of their vehicles. This is done through a “bodge” round in which each player can attach up to two parts and affect other players or themselves in various ways. Next comes the rush stage where players choose a vehicle to head to the heap, duke it out with other players, while trying to defend against other players’ attacks. The vehicle players choose will have certain effects in this round based on what the player attached. After the rush round, players may take parts they hauled and attach them to their vehicles. Once a player has attached three parts to all of his or her vehicles, the players enter the Pileup round. This is basically a re-hash of the rush round with more cards. The only difference is that the only time a vehicle can use an ability is if it is in Turbo (which means it had three parts before the pileup). The victor in the pileup wins the game. Not too much to it, but it is a nice quick game for all ages. I played a Demo at Gencon and really enjoyed the game. It is almost a combination of the old Car Wars Card Game and War. The game is relatively fast and plays well with 4 players. There were a few odd rules, but the person running the demo was running 3 different groups at the same time, so I am sure we got a few things wrong and I would love to try it again. Players play cards from their hand each round to add some items to their vehicles [Each card dictates what vehicle can have the item on it]. These cards can boost your ability to draw more cards, get freebies at the end of each round and also to battle the other players for teh choice selections from the Heap! I can see this game may get redundant after several plays, but I can not imagine it ever losing its appeal altogether. Add a Review for "Heap"